The Short Circuit Dream Fund is a registered Canadian charity that makes the dreams of critically ill children in Newfoundland and Labrador come true. Since becoming a registered Canadian charity in July 2009, we have made the dreams of more than 20 critically ill children come true. The Short Circuit Dream Fund was founded in 2007 by William Short at the age of 14 with a goal of giving sick children something to make their everyday better. With a great deal of thought, the Short Circuit Dream Fund’s Board of Directors voted to rebrand the charity, giving it a new name and a new look. We continue to step in the same direction — our mission has not changed — and we look forward to the support of the people and media of Newfoundland & Labrador for many years to come. Curious about our new name? Our new brand will launch with a video on our Youtube channel at 12 Noon, March 20, 2014. We encourage you to share this video using the hashtag #LiftingHearts to help us spread the word, telling all of Newfoundland & Labrador that changes are here. Please join us in celebrating as we continue lifting hearts, one dream at a time. For questions or media inquiries, please contact William Short at william@scdf.ca or 709-277-5177. The Short Circuit Dream Fund is preparing for the 2nd Annual Zachary Pittman Memorial Golf Tournament this summer. To ensure the event is successful we’re forming a Planning Committee. Members of the Committee would assist the Short Circuit Dream Fund with soliciting donations, recruiting teams and sponsors, and general planning. If you’re interested or know someone who is, please contact William Short at 709-277-5177 or william@scdf.ca. Over the next two months the Short Circuit Dream Fund will be going through some major changes. After more than six years of learning we’re hoping that the upcoming changes will help us more effectively support our cause. Please bear with us while these changes occur as we will begin to look very different during this time. We look forward to seeing your continued support when we relaunch in February 2014. If you have any questions during this time please contact William Short at william@scdf.ca. Join the Short Circuit Dream Fund and Memorial University’s Residence Life Charity Committee as students across Memorial’s St. John’s campus come together to make the dream of a sick child come true. The Short Circuit Dream Fund (SCDF) is a registered Canadian charity that makes the dreams of critically ill children in Newfoundland and Labrador come true. Since becoming a registered Canadian charity in July 2009, we have made the dreams of more than twenty critically ill children come true. SCDF was founded in 2007 by William Short at the age of 14 with a goal of giving sick children something to make their everyday better. On Tuesday, November 19, MUN’s Residence Life Charity Committee will be hosting a Trivia Night with a television theme. This event is open to students as well as the general public. Teams of up to 5 people can be registered on-site for $20. It will take place from 7-10 PM at the Billy Miller Common Room in Corte Real, Burton’s Pond, St. John’s. The goal of the Trivia Night is to raise funds to help make a dream come true for four-year-old Paul Oram of Glovertown through SCDF. Paul was diagnosed with Burkitt’s Lymphoma in February 2013 and is currently undergoing treatments. On Wednesday, November 20, the Short Circuit Dream Fund will be presenting Paul with his Dream, SCDF’s 23rd Dream Presentation. This event will also be open to the public and will take place at 2:00 PM at the Junior Common Room in R. Gushue Hall, Memorial University, St. John’s. 2013 AGM & General Election: A time for growth. After an incredible year celebrating our fifth anniversary it is time to hold our 2013 Annual General Meeting & General Election! We’ve changed a lot in the last few years, and we’ve got even bigger changes coming. For this reason we feel that we need members of our Board of Directors to represent the entire province of Newfoundland & Labrador. The Short Circuit Dream Fund is searching for expressions of interest from anywhere in the province if you think you have something to give to this continually growing organization. The 2013 Annual General Meeting & General Election will take place at the Marystown Hotel & Convention Centre on October 27, 2013. But don’t think you can’t be a part of this from elsewhere! We’ll also be streaming Live on YouTube Live for everyone’s convenience. If you have any questions or would like more information on how you can be a part of our Board of Directors please email scdf@scdf.ca or call 709-277-5177. In the Weekend Edition of The Telegram and The Western Star, August 17, 2013, there is an ad thanking all those who helped make this past year possible. Built into the ad is our website and a QR code that will link you directly to the listing of those names in which you asked to have your butterflies released in honour of at the Wings for an Angel event. Click here to view the online listing or see the attached ad below. As of 9:15 NL time, July 20, 2013, ALL Wings for an Angel butterfly release events will be going ahead as scheduled. Please remember to bring your ticket to the event to receive your butterfly. Due to the volume of butterflies ordered we cannot give butterflies to anyone that does not have a ticket. Varying by location there may be extras available for purchase for $20 once regular distribution is complete. Please arrive at your local event at the time listed with the location below. There is no need to be earlier than the time noted. We look forward to seeing you at your local event. All events are open to the public, so bring all your family and friends! If you have any questions, call William at 709-277-5177. The Short Circuit Dream Fund (SCDF) is a registered Canadian charity that makes the dreams of critically ill children in Newfoundland and Labrador come true. Since becoming a registered Canadian charity in July 2009, we have made the dreams of twenty critically ill children come true. SCDF was founded in 2007 by William Short at the age of 14 with a goal of giving sick children something to make their everyday better. 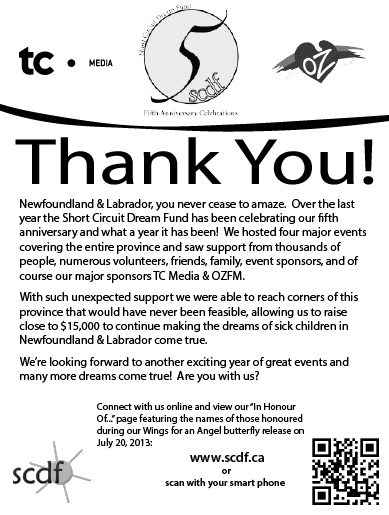 Wings for an Angel is a province-wide butterfly release organized by the Short Circuit Dream Fund in memory of our second Dream Child, Kendra Pike of West-St. Modeste, Labrador, who passed away just two months after receiving her Dream from us. This is the final event of our Fifth Anniversary Celebrations, ending a full year of exciting events. Through the lasting spirit of Kendra, we gave Newfoundlanders and Labradorians the opportunity to purchase butterflies to be released in honour of their own loved ones, and did they ever respond! More than 1200 butterflies have been purchased and will be simultaneously released at our five release locations province-wide. All members of the media and public are invited to attend. 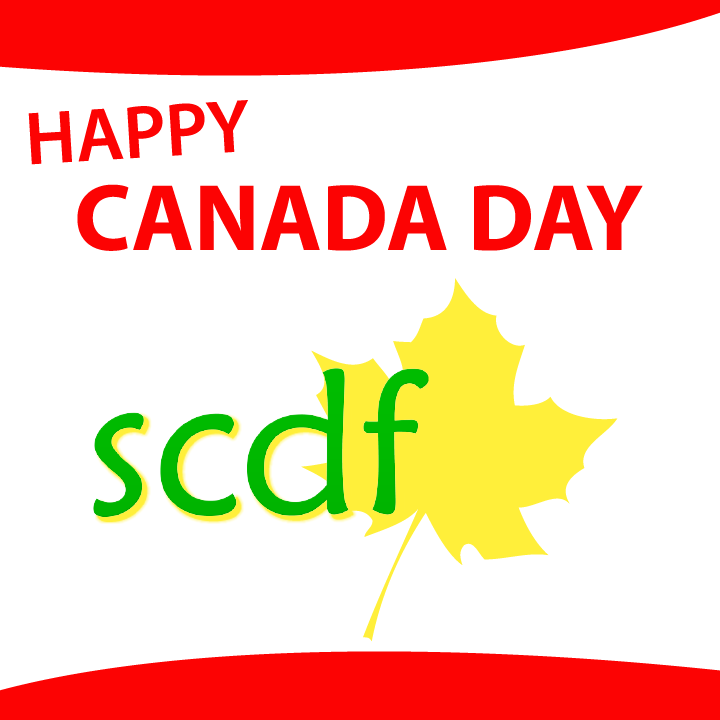 HAPPY CANADA DAY from all of us at the Short Circuit Dream Fund (SCDF)! We hope you enjoy your day with family and friends and continue to support all the wonderful things that we have accomplished as Canadians. I am Joshua Groves, the website designer at SCDF. We have recently gave SCDF’s main website a complete makeover, in hopes of bringing further attention to this wonderful cause. The new website is mobile-friendly, so you can easily keep up-to-date on SCDF’s events even when a computer is not accessible. Thank you for your continued support and we hope that you enjoy the new look.